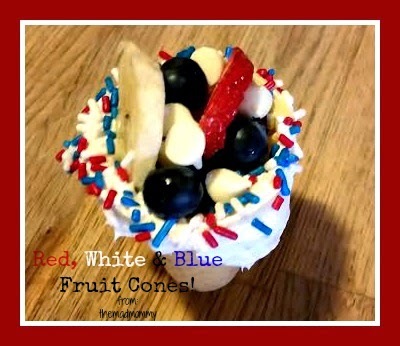 Red, White and Blue Fruit Cones! Think Outside The Toy Box and Get Kids In The Kitchen! They are all right around the corner! Here is a fun, refreshing treat for summer! The best part? The kids can help you make them! 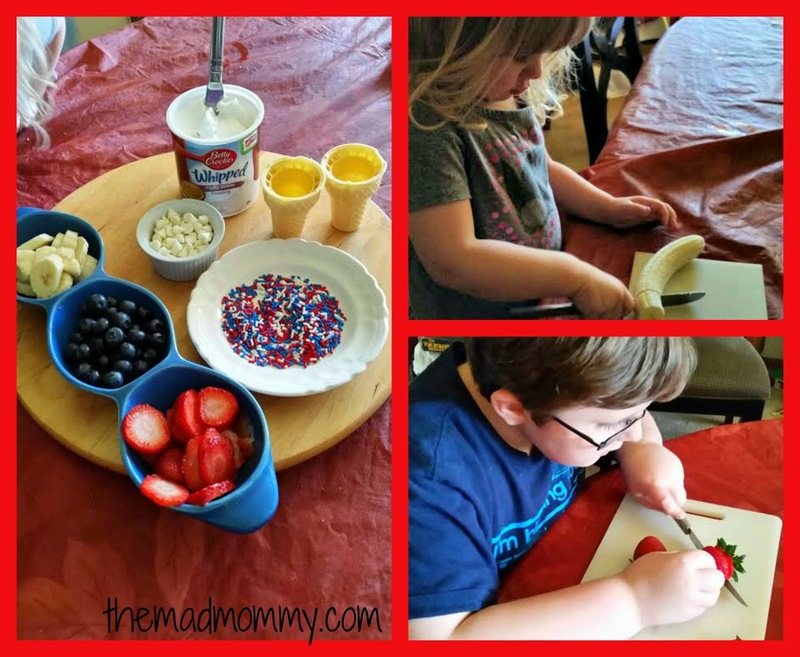 Getting your kids involved in the kitchen is another great way to think outside the toy box! Food prep can be really fun and it also encourages the implementation of necessary life skills! This week we are using ice cream cones to #ThinkOutsideTheToyBox! 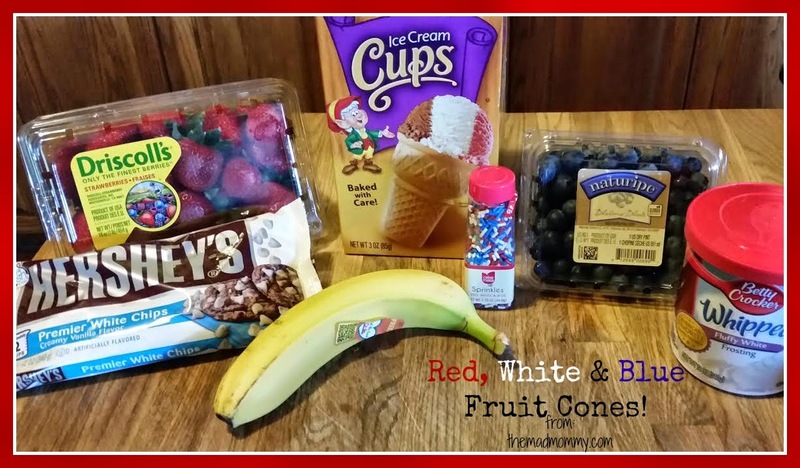 Red, White & Blue Fruit Cones are fun, easy and delicious! You could also use coolwhip or whipped cream instead of frosting. Get all of the fruit prepped and set everything up. Frost the outer rim of the ice cream cone and then dip it in the sprinkles. As you can see, my whole family approves! So remember, having fun and thinking outside of the toy box can also include getting your kids into the kitchen! This is part of the Think Outside The Toy Box series! 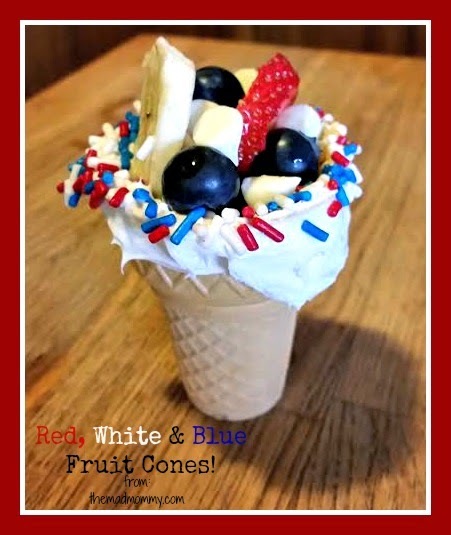 Please, check out the other great ideas on how to use ice cream cones and if you have a great ice cream cone idea, activity or post, LINK IT UP! Visiting and pinning from Bloggers Brags! Why Thank you, Jhanis! They were so tasty and fun! I love her messy face, LOL! I'm glad you like it, Janine! 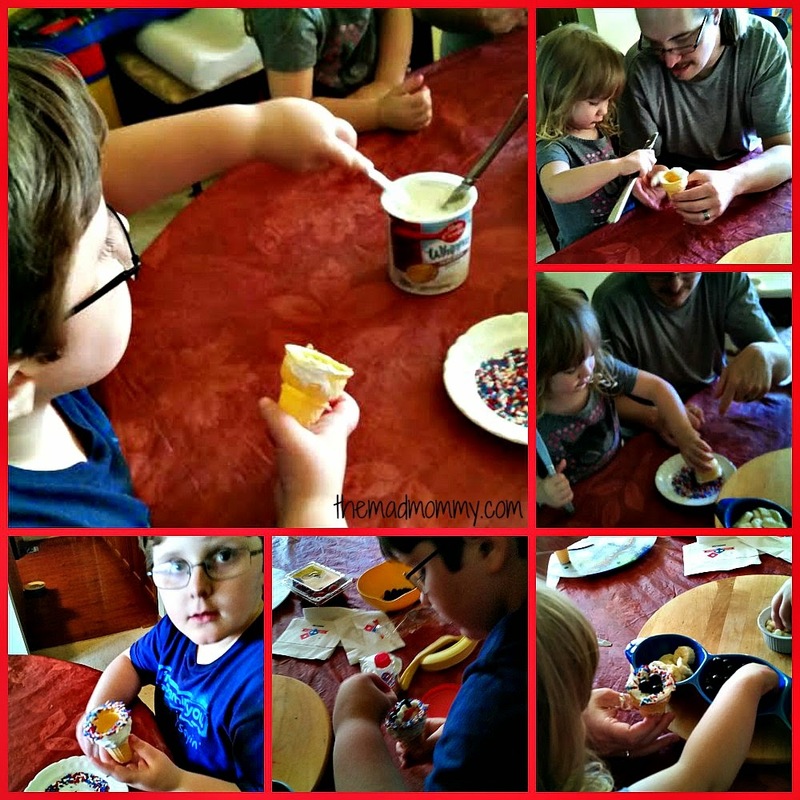 My kids had so much fun being involved in making their own snack! It was awesome and they are very delicious! Wow what a treat! My kids would LOOOOOOVE IT! That looks so Pinteresting Echo! LOL Looks good! I want one! And the little Miss looks so adorable! I am going to try these with my kids. The icing and sprinkles are tasty! The fruit with the white chocolate chips is pretty darn tasty too! 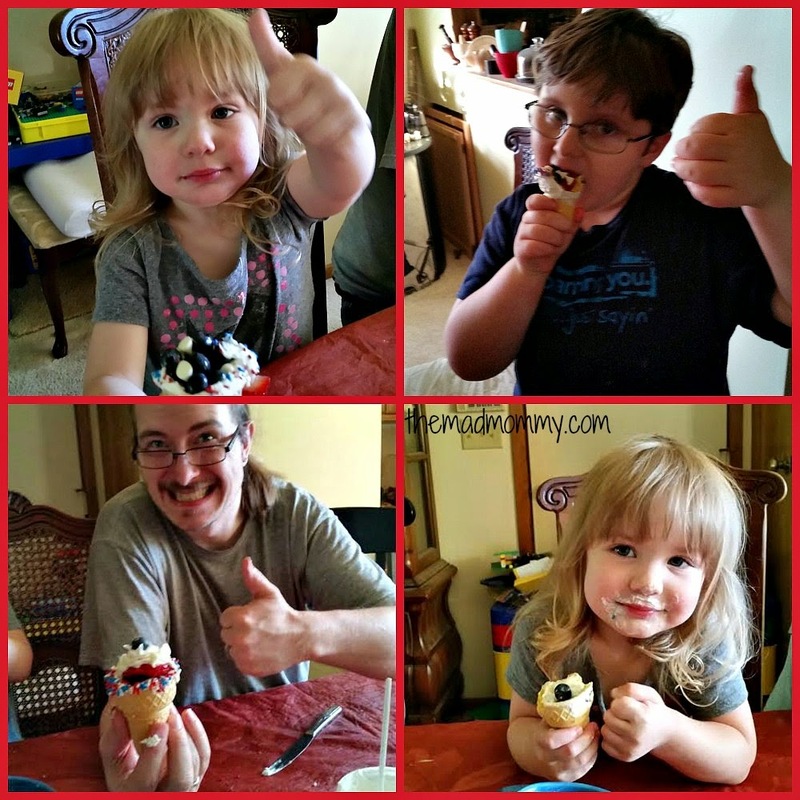 It was such a hit with my kiddos and my hubby! Oh for cute! I just pictured you and Dylan doing it and it was awesome! It was so fun and easy! The kids loved being involved! Pinned it! I like any activity that involves me using whipped topping and sprinkles. Darling!!!! This looks like so much fun and just healthy enough for me to like it and sweet enough for my nieces and nephews to like it!!! It is definitely a win win on the dessert/healthier side! Mmmm, Sprinkles! Thanks for pinning, Tamara! Sprinkles make everything more fun! We love fruit and yogurt here too! Thanks Heather! I am so glad you stopped by! We really did enjoy it! Thanks for coming by the Wonderful Wednesday Blog Hop. Love your post and appreciate you taking the time to share. Thanks Shari! I'm glad you enjoyed the post! It was super delicious, Chrissy! Love this idea and could so eat a cone right now! Thanks for sharing with us Echo, I am sure the grandkids will be happy with this recipe! If they are anything like my kids, they will gobble them up! Stopping by from the link up. Those are really cute! This is really a great activity Echo! Visiting this again from Whatever Wednesday, thanks for linking this up! These look yummy, yummy, delicious!! I even have the supplies in my house right now, if I could stop eating frosting out of the container with a spoon. WHAT!?! The kids are gone!! These look so fun and festive! I love learning activities like this. Getting your kids into the kitchen is great! Thanks for linking up at the Shine Blog Hop! Thanks Ileana! I appreciate you coming by! Bwahahaha! I totally licked the knives and spoons when we were done. That whipped frosting is delicious! Thanks Tiffany! I do love getting my kids in the kitchen! They can learn so many skills! This is such a great idea and so easy. Thank you for sharing on our Four Seasons Blog Hop. Pure genius! Simple but cute and creative and outside the box. Love the thumbs up! Linking up from Pretty Pintastic Party. Oh, how much fun! And I bet they tasted wonderful. Hope you have a great day! How fun! My little boy would have a blast doing this, thanks for the idea! Oh girl, yummy! These look really good, but I would have to have all junk for lil man's because he won't have anything to do with fresh fruit unless I go with pineapples or apples! Crazy kid! Lil miss on the other hand will eat it all! Have a great week! Awesome! I am pinning yours now! It was a lot of fun and tasty! Thanks Aimee! We had so much fun doing it! My kids really enjoyed themselves! They were so delicious! You could really put anything in them! It's such a good idea to have kids do more than just "play" and when they're involved they learn so much more and most times like it better! Thanks Kim! I love linking up with you guys! It's so important to get them involved. It teaches them more than people realize! For sure! Thanks for hosting! Awesome Idea! I love the red white and blue idea a lot! Thanks for Linking up at My Favorite Things Saturday! Thanks Steph! It was super easy to make! Very creative! I love how you added fruit to it! A little healthy kick to ice cream! I'm loving this series. Thanks for sharing with Creative Style! Thank April! We are loving this series too! So much fun!